I’m not surprised that Pascal Hauret of Veolia wrote to the Camden New Journal recently to justify the way they collect our recycling, but he didn't quite tell the whole story so I wrote the following letter to the CNJ to fill in the gaps. Mr Haret is right that many councils use commingling – or commangling as it’s sometimes called – that is the mixing up all recycling together. Why is that? Here’s the basic problem – the government sets us recycling tonnage targets, a bit like the Soviet Union used to do in its Five Year Plans. That’s why Camden (under Labour) brought in commingling in April 2006 - because it’s the easiest way to increase recycling tonnage. Residents put all their recycling in one box and it gets crushed up in the back of a “recycling” truck (which looks very much like a waste truck because it is). 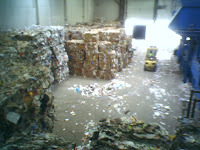 It then gets taken to what is euphemistically called a “Materials Recycling Facility” (MRF) in Greenwich. 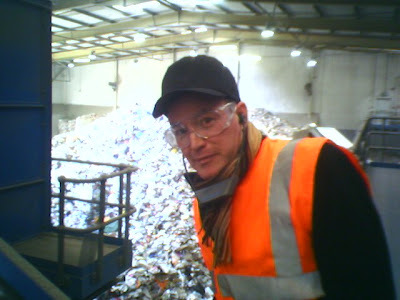 I’ve been there and talked to staff so I know that it’s virtually impossible for man or machine to separate the commingled collections properly (see photos of me at the Greenwich MRF). For example, the paper gets so contaminated by glass fragments and the remnants of what was in the bottles and cans that no British papermaker can use it to make recycled paper. So it gets sent to the Far East. And what happens to it there? Maybe Malaysian papermakers have lower standards or better technology. Maybe not. Either way it would make more sense not to contaminate the paper in the first place. The glass that goes to Greenwich gets so crushed up and contaminated that no British or French bottle maker can use it to make bottles so it’s used as aggregate for roads. The carbon cost of sending glass through a MRF for it to end up as aggregate is high. It would make much more sense to keep it out of the commingled collections and give it straight to companies that make bottles or jars. And depressingly we create more carbon dioxide putting glass through the commingled system than we would if we simply dumped the bottles in a landfill site. But don’t take my word for it – ask the Campaign for Real Recycling, which was set up to try to improve the quality of UK recycling. They would prefer source-separated recycling ie separation at the point of collection, which is what Camden used to do and Hackney and Barnet, among others, still do. The main downside is that this would require a new (and expensive) fleet of recycling trucks that are able to collect separated streams of recycling. And yes it would require a few more trucks on our streets because improving the quality at the start of the process takes more time so let’s get on with fuelling them using biomethane made from food waste, which has virtually no carbon or noxious emissions, and which Veolia is currently trialling in Camden. 1) Separate out the glass from the commingled collection to minimise contamination. This could be done relatively easily by giving residents a separate bag for glass. 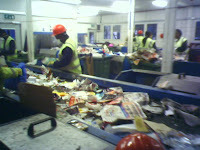 2) Collect paper and cardboard (“fibres”) separately from glass, plastic and metal (“containers”). This method allows reasonably easy automated separation of “containers” and it means any leftover food and drink in the “containers” doesn’t contaminate the paper. The whole of Germany uses this system. 3) Take the cost of waste and recycling out of the council tax and put it into the cost of the collection bag. Local shops could sell bar-coded, colour-coded bags. A black bag – for non-recyclable waste - would cost the most and a green bag – for the most valuable types of recycling eg metal and plastic – would cost the least. This is what Belgium does. It’s the most radical option but my favourite because it encourages people to reduce the total amount of waste they create and to recycle more of it. The Campaign for Real Recycling says commingling is the worst possible recycling system in terms of environmental impact and I agree. The Leader of Camden Council is on record as saying that kerbside commingled collections are of dubious environmental value. 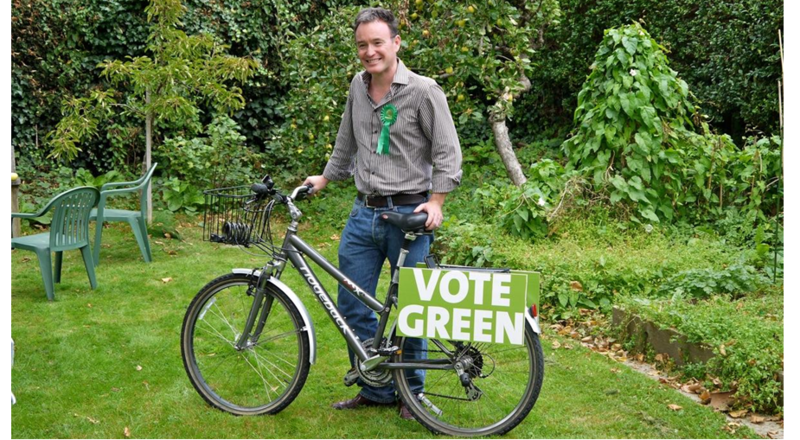 And commingling is the main reason that, after we won the 2006 election, Camden’s Liberal Democrats requested an audit of our recycling (which for some reason still hasn’t seen the light of day). An administration that seeks to put sustainability at the heart of everything it does should seek to make our recycling more sustainable.